a quick guide to help you learn the ins and outs of a webinar. Take a look. There are two ways of selecting a webinar. If you are lucky enough, you might stumble upon one right in your very own inbox. Otherwise, you have to religiously hunt for the right webinar by following relevant sources. With a little effort, you can actually sign up for some good webinars to attend. There are websites and event directories such as Webinar Central and Event Span showcasing a list of on-going webinar events. You can also find webinar events on social media platforms like Twitter using hash tags with relevant keywords. It’s hard to keep up with all the webinars taking place these days. 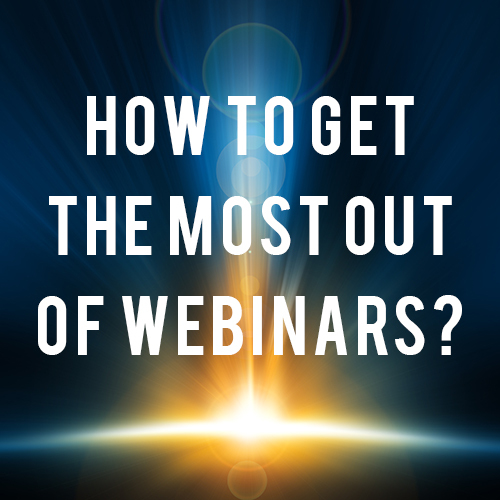 So, the question is: How do you select the right webinars, without wasting time? The best way is to ask yourself – “What’s in there for me? Is it a topic of interest, an upcoming trend, or is it being conducted by one of the pioneers in my industry?” Be sure to select those that give you something new to learn. However, if a webinar looks like a sales pitch rather than sharing something valuable, you are better off skipping it! 1. Saves Money and Effort – Webinars save substantial cost both to the organizer and participants. The organizer can put together a webinar at a remarkably lower cost than a conventional seminar. Attendees, on the other hand, save money as webinars allow them to gain deep industry insights without having to travel outside their home or office. 2. Allows Two-Way Communication - Webinars allow interactive learning over the web via conferencing tools. While attending live webinars, one can take the maximum benefit out of it by actively interacting with the presenters and attendees. 3. Expands Professional Network – Being an interactive educational experience, a webinar allows the attendees to share and enhance their knowledge, thereby building mutually beneficial relationships. A webinar is a great opportunity to build connections among attendees and presenters. •	You recently found webinar of interest either from the organizer’s website or through an invitation email. Without wasting time, you registered for attending it. You received a confirmation email containing the website link and day and date of the webinar. However, you missed the webinar and this is not the first time you have missed it. Well, it happens to many of us. The best way not to miss out a webinar is by setting a reminder on your phone or laptop. •	When you login to the webinar, you’ll see a control panel on the right side of your screen. The control panel has a ‘Raise Your Hand’ icon allowing you to raise a point or ask a question. You can also type in your question in the ‘Questions Bar’. More often than not, the organizers mute your mics, primarily because it might hinder the webinar from running smoothly. It’s good to ask questions when the attendees are asked to do so. If your question is relevant, the presenter might read it out to the audience so that other participants can benefit from the answer as well. As a matter of fact, you should proactively make a list of specifically targeted questions for them. This will not only give you an opening conversation to interact with them but will also help you set the right impression. •	Make sure you have a strong internet connection. Once broken, it might be very tedious trying to enter the webinar again. To ensure a smooth connection, avoid downloading files and streaming videos while attending the webinar. Once the webinar is over, you should go back to your hand-written notes and assess what you have gained from it and how you can apply the learning to improve your skills and knowledge. Also, consider sending a thank you note to the webinar host and the presenters. Don’t shy away from doing a follow up. It is a great way to help you stand out from the rest of the participants!